One of the people I was most excited to meet at Martha Stewart's Bloggers' Night Out recently, was of course, her own decorating genius/guru Kevin Sharkey. He was kind enough to pose for a photo with me and even autographed a copy of the newest issue of Martha Stewart Living (not yet on newsstands at the time), I could hardly wait to get home and pour through the pages of his eagerly anticipated house tour. Finally, after months of following along the renovation process of Kevin's New York apartment on his blog, the time has finally arrived to reveal the spectacular results. Kevin covered an entire living room wall with mirrors. "Not only do the mirrors reflect the river, they transform the view into a work of art," he says. 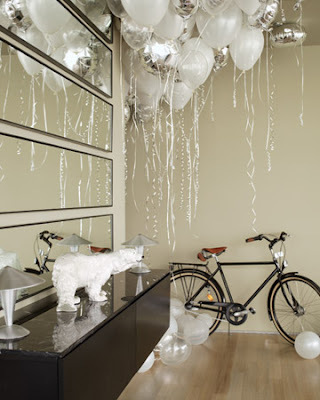 The balloons are not a permanent fixture (although they should be!) but were ordered for his housewarming party, christening the new space. 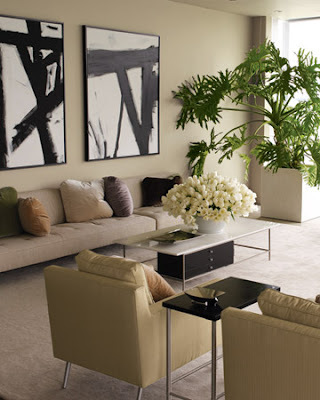 Large paintings in the style of Franz Kline are a focal point of the living room (also the bedroom, below) and add a sense of drama to the otherwise calm and neutral space. It seems almost every room in the house boasts a spectacular view of the Hudson, the office is no exception. Throughout the space, there seems to be a strong theme of Eastern zen meets contemporary modern. Heavy black furniture, clean lines, Buddha statuettes, and chinoiserie panels in the dining room. 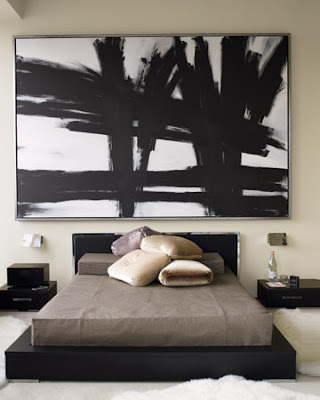 The Franz Kline inspired artwork (pictured below) beautifully compliments the minimal modern aesthetic and helps to tie in all the dark wood pieces. Throughout his home, Kevin has used thick, plush rugs and sheepskins throughout the space. They prevent it from ever looking stark or too austere and create a relaxed air for entertaining favourite houseguest - like (the other) Sharkey, Francesca and Ghenghis Khan (below). Kevin chose the Eero Saarinen Grasshopper chair because he loved "its articulated shape." Throughout his home, Kevin is methodically organized, with items all neatly colour coordinated and stacked in orderly groups. While Kevin claims not to be much of a chef, he loves to entertain so the kitchen is very streamlined and functional. 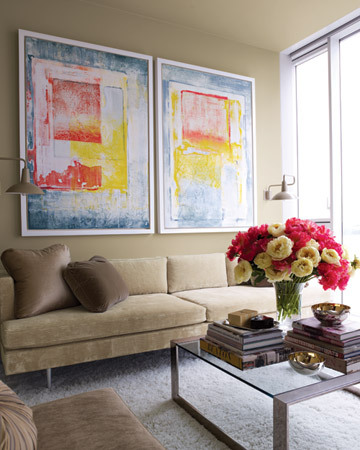 I loved the soft putty tones in one of Kevin's favourite rooms, "I love how it shifts from khaki to ivory over the course of a day," he says. The shade he chose? Heath from the new Martha Stewart Living paint collection. One of Kevin's greatest pleasure is creating artful floral displays like this one in pink, blush and white peonies. With so much attention to detail, this meticulously designed space just seems to suit Kevin to a t! I'm sure he'll be very happy here. Omg I want to live there! Beautiful. And I LOVE the pups!! OH I LOVE! So gorgeous! Oh wow! What a wonderful living space. And anyone with pets and a bike is A Plus on my list. 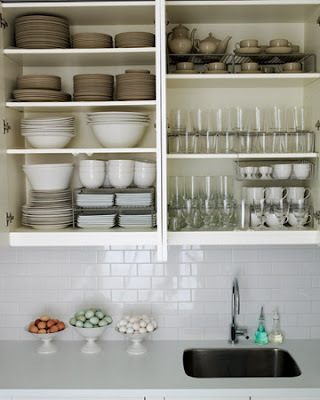 If only my kitchen cabinets were so organized! What a beautiful and calming space! 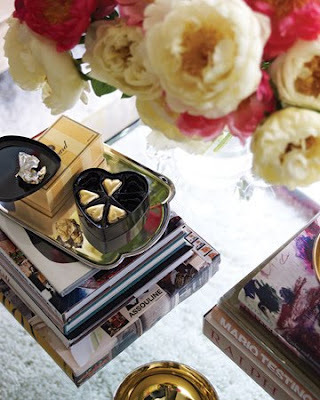 Perfect space - and love Martha's dogs watching tv (Those are Martha's dogs right?!)! Love Kevin's apt. & huge fan of the art he chose. The bedroom art makes an incredible statement. Bravo to Mr.Starkey! Yes the dogs are all Martha's. I am in love with this apartment. It is so beautiful and elegant, with clean lines and organization everywhere...two of my favorite forms to find in a newly remodeled home. I never thought I would love beige/khaki and white together so much, but they really do suite the taste of this NY pad. I came across your post this afternoon while browsing interior design blogs and the topic of window treatment selection was very interesting to me. It is true that you must dress your windows appropriately to bring out their true beauty. Thank you for writing and as a special thanks to you and your readers, I would like to offer a 20% off coupon using this code upon checkout: BLG20. i really wanted to see his place. There's too much art inside Kevin's home. It's a like a house of paintings.